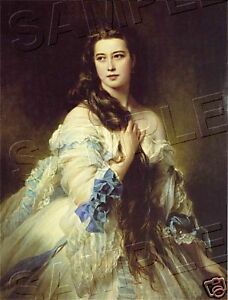 Details about Beautiful VICTORIAN Lady LONG HAIR CANVAS Giclee Art Print - LARGE 13" x 19"
Listed By: Dealer or Reseller Size Type/Largest Dimension: Large poster Size: 13" x 19"
Print Type: Giclee & Iris Print Edition Size: 13" x 19"
This Victorian era portrait would be just perfect for any room and truly a delight to enjoy in any setting. VICTORIAN LADIES ART PRINTS. She is oh, so fashionable in her lovely sheer fabric gown adorned with lace, ruffles, blue ribbons and bows. Spectacular quality!! Beautiful work!!!! Absolutely LOVE it!! !